Press releases of QSound Labs, Inc. one of the world's leading digital audio technology companies. QSound develops and licenses proprietary audio solutions that include virtual surround sound, positional audio and stereo enhancement for mobile devices, consumer electronics, PC/multimedia, and Internet markets. 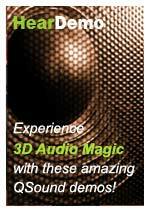 From 3D audio to online e-commerce, QSound has been blazing trails for innovative technology products and services. Below, you'll find recent press releases about QSound Labs' corporate, financial and product news. Copyright © 2012 QSound Labs, Inc.